Joe Leydon, Variety про фільм «Гра пам’яті». 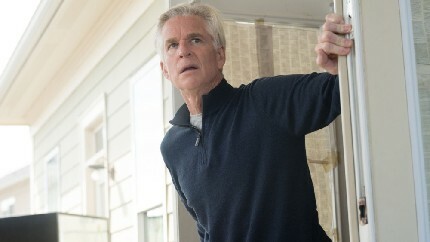 Matthew Modine is outstanding as an amnesia-stricken bank robber in Brian A. Miller’s VOD-centric thriller. With: Sylvester Stallone, Matthew Modine, Ryan Guzman, Meadow Williams, Tyler Jon Olson. Christopher McDonald, Sergio Rizzuto, Colin Egglesfield, Swen Temmel. Of course, he does get a little help from co-stars Ryan Guzman, Meadow Williams and Tyler Jon Olson, cast as conspirators who smuggle Modine’s character, MacDonald, out of a prison psychiatric ward. Seven years earlier, MacDonald and two equally hard-pressed buddies robbed a bank and then stashed what they considered to be their fair share of the $20 million haul before a rendezvous with partners in crime. Unfortunately, the partners took unkindly to this division of spoils, and expressed their displeasure nonverbally. The ensuing shootout left MacDonald’s buddies dead, and MacDonald himself comatose due to a serious head wound. Eventually, MacDonald woke up — but with a bad case of amnesia. Still hazy after all these years, he’s unable to tell police detective Sykes (Stallone), FBI agent Franks (McDonald), or anyone else where the loot swiped during the bank heist remains hidden. Ultimately, it’s up to a fake security guard (Olson), a shady nurse (Williams) and their smooth-talking collaborator (Guzman) to free MacDonald, inject him with an experimental drug, and jog his memory by taking him on a tour of locations tied to his forgotten past. Periodically, director Brian A. Miller (“Reprisal”) and scripter Mike Maples cut away from their progress, usually to show Sykes and Franks intently monitoring the manhunt for MacDonald, bickering over jurisdiction, and more or less daring the audience to guess which one of them isn’t all that he seems. “Backtrace” moves at a satisfyingly brisk clip, and actually manages to spring a surprise or two without unduly stretching credibility. Editor Thomas Calderón enhances the suspense during a few key scenes with shrewdly calculated cross-cutting, while lenser Peter A. Holland keeps things visually interesting even while shooting in such clichéd locations as a police squad room and an abandoned factory. Modine dominates each scene in which he appears, and a few where he doesn’t, as his character struggles to make sense of literally painful memories. Still, he doesn’t entirely overshadow the capable efforts of his fellow players. Stallone is a standout — big surprise, right? — largely because he and director Miller smartly exploit his stature as a weathered icon to add depth, or at least gravitas, to a fuzzily defined supporting role. Unfortunately, even Stallone is unable to add much oomph to the disappointingly flat final scene, the only significant flaw in an otherwise efficiently workmanlike B-movie. Reviewed online, Houston, Dec. 12, 2018. MPAA Rating: R. Running time: 87 MIN. Production: A Lionsgate Premiere release and presentation in association with Grindstone Entertainment Group, Emmett Furla Oasis Films and Diamond Film Prods. of an Emmett Furla Oasis Films production in association with Dreamscape Prods. and The Fyzz. Producers: Randall Emmett, George Furla, Mark Stewart, Ambyr Childers, Matt Luber. Executive Producers: Alex Eckert, Ted Fox, Vance Owen, Mark Lawyer, Martin Richard Blencowe, Simon Williams, Christelle Conan, Arianne Fraser, Delphine Perrier, Henry Winterstern, Sam Slater, David Bernon, Scott Carmel, Sergio Rizzuto, Marc Goldberg, Noel Ashman, Bryan Brucks, Wayne Marc Godfrey, Robert Jones, Meadow Williams, Swen Temmel, Barry Brooker, Stan Wertlieb. Crew: Director: Brian A. Miller. Screenplay: Mike Maples. Camera (color): Peter A. Holland. Editor: Thomas Calderón. Music: Tim Jones.